I must confess I approached this book with not just a little trepidation. Anyone who has ever taken a passing glance at the ‘Mind, Body & Spirit’ section of any bookstore and seen the plethora of titles around this subject might understand my reticence. Many such books make claims about encounters with magical beings, angels and spirits, (it’s not that I doubt the existence of these, only the sincerity of the authors’ belief); many about impending apocalypse, whilst some of them take some fairly hefty and serious concepts such as Hermeticism and attempt to boil them down into ‘secrets’ easily digestible for the modern consumer. How refreshing then for a tome of this nature to be set out so simply, written with such clarity by Psychologist and writer Philip Carr-Gomm (chosen leader of the Order of Bards Ovates & Druids) and Richard Heygate, and referenced so heavily with resources that the reader is more than enabled to investigate further for themselves. 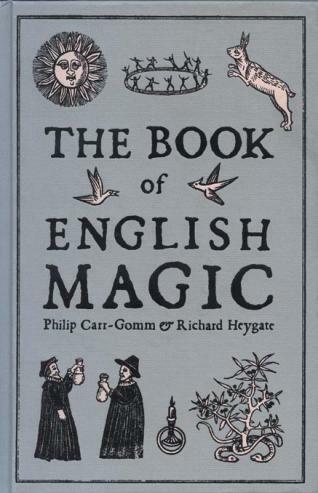 The English Book of Magic successfully transcends the ocean of double speak and down-right gobbledegook usually a given in Occult literature. Even if you normally approach this subject with a great deal of cynicism, you’ll find this book a fascinating look at an enduring historical phenomenon - peculiar but not unique to these islands. Set against our current addiction to materialism and our post Enlightenment mindset, whose mechanistic worldview jostles uneasily with what we actually experience within the world (you can’t treat a human like you would a machine and expect good results, humans specialise in stories and myth not productivity), The Book of English Magic is a beautifully written counterpoint to the consumerist dead-end we’ve found ourselves up against. Perhaps it’s time to re-evaluate some of the knowledge our forbearers mastered? But the joy of this book doesn’t rest only in providing a breath of fresh air or journey through the ages. Carr-Gomm and Heygate are at pains to illustrate Magick as a living belief system illustrating this fact beautifully with biographies, interviews and anecdotes from practitioners of these sacred arts and profiles of some of the biggest names of the ages. Thus you have experiences of people like Dowser Peter Taylor recounted alongside the story of a modern Druid -‘Adrian’ from Bristol - an alchemist from Wales and my personal favourite; Shaman Peter Aziz who irresistibly sketches out his initiation into the other worlds. If you still need help being drawn in, every chapter includes a ‘things to do’ section which, as I alluded to earlier, helpfully details everything from preparing herbal remedies to locating local sites of interest or books and internet sites to continue research; the book is as much guidebook as it is grimoire adding much to its already deep appeal. Highly recommended!